ChemLine® 784/32 delivers significantly improved product performance and anti-corrosion resistance. ChemLine 784/32 coating is formulated with a unique polymer designed and engineered with high functionality. This bridged aromatic backbone structure, when polymerized, forms up to 784 cross-links. ChemLine 784/32 cross-links predominately through an ether (carbon-oxygen-carbon) linkage. This eliminates high concentrations of hydroxyl groups (found in epoxies) and precludes formation of ester groups (found in vinylesters) which are subject to hydrolysis and acid attack. Chemical Processing – Tanks, vessels, hazardous waste, secondary containment, and chemical plant floors, etc. ChemLine is generally recognized as safe (GRAS) for food grade cargoes. Majority of cross-links are through Ether (C-O-C) bonds. Ether bonds are one of the strongest bonds in chemistry. Ether bonds give flexibility with chemical resistance. This is an abbreviated listing of the more than 5,000 chemicals that have been tested. This information is intended to serve as a reference guide only. 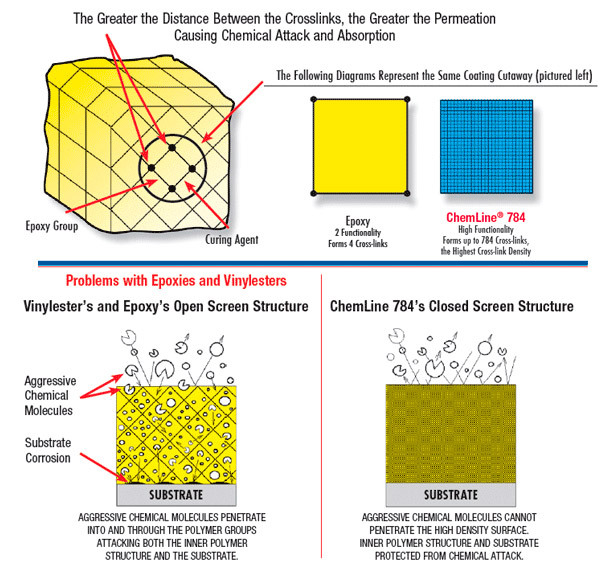 The end user is responsible for determining if ChemLine® is the appropriate coating for the specific application involved. Contact your ChemLine Representative or the ChemLine Customer Service Hotline +01 440-937-6218 for detailed specifications prior to any final coatings recommendation or application. For more than a decade ChemLine coatings have withstood the tremendous stresses and extremes of chemical attack and abrasive wear. ChemLine has been proven worldwide under the most arduous operating conditions, from resisting the most aggressive chemicals to handling hot pipelines in sub-freezing temperatures, with a history of success. Based on this experience, the development of ChemLine 784/32 represents a quantum leap in chemical resistant polymer coatings.